To get things rolling, Google is already throwing out a benefit for subscribers. When accounts go live, a $5 Google Play credit is being offered that you can add to your account for app purchases, movie rentals and purchases through the Play Store. There are also hotel discounts available by doing searches for hotels through Google Search. 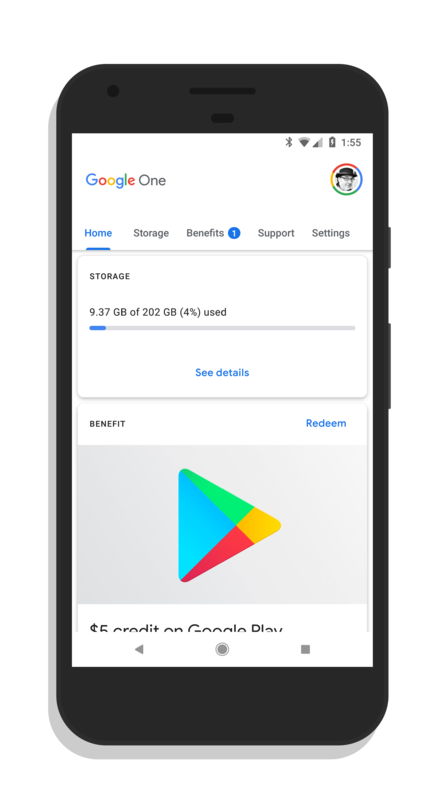 The Google One app itself is a bright, clean example of Material Design with large panels of information and a top navigation section for the different parts of the app. Finally, it also appears that the new Google Drive pricing has gone live in the app too. The 100GB plan is now $1.99/month while the new 200GB plan at $2.99 per month is also available.